Aeromotive’s New EFI to Carb Regulator allows any car or truck, originally equipped with a return-style EFI-powered engine, to affordably convert to a standard carburetor while retaining the full, stock EFI fuel system components. All with a single regulator. With the new EFI to Carb regulator, no changes to the original fuel system are required – you just bolt on a carburetor and go. It allows use of the stock EFI pump in the tank, the stock EFI supply and return lines, and the stock fuel filter. 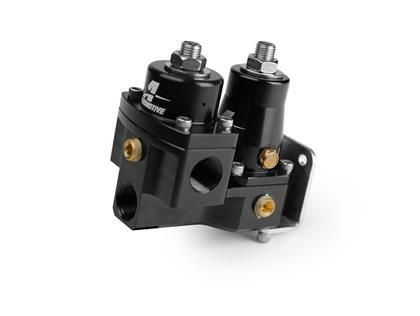 This innovative new regulator provides seamless control of the bypass pressure to keep the EFI fuel pump happy while enabling you to keep the output pressure low enough to feed any off-the-shelf carburetor. Bypass pressure is adjustable from 8-16 psi, regulated pressure to the carburetor is adjustable from 5-9 psi, and installation is painless thanks to the universal, 3/8” NPT inlet, outlet, and return ports. Two 1/8” NPT gauge ports allow both line pressure and carbureted pressure to be adjusted and monitored. Ordinary 3/8” NPT to AN, or 3/8” NPT to barb fittings may be used, making plumbing easy to do and the fittings inexpensive. The new EFI to Carb regulator from Aeromotive allows a good car or truck to be back in service quickly after installing a carburetor. No need to spend an arm and a leg or countless hours diagnosing and/or repairing a complicated, worn-out EFI system, and no more need to perform a costly redo of the fuel system for a carburetor!